1 generous tablespoon or honey or maple syrup. Mix your oats and nuts together in a bowl. Using a non-stick fry pan, toast the mixture (turning it constantly to avoid burning) until it turns lightly golden. It normally takes only a minute a so so be careful to not let your oats get burnt. Repeat in batches until you’ve toasted the whole lot. Melt your butter and honey/maple syrup together, pour over your toasted oats and mix well. Preheat your oven to 180 degrees (celsius) and spread out your oats and nuts on a baking tray. Pop them in the oven and give them a good toss every 3-4 minutes for the next 10-15 minutes. When they’re beautifully golden brown and toasted all over, spread them out on a piece of grease proof paper and allow them to cool completely before using/storing. If you’ve accidentally burnt some of your oats or you find you have a lot of burnt powder from the oats/nuts, here’s a trick: sieve your mixture through a strainer and you’ll see all the burnt powdery bits fall right out. Retain half of the grated lemon zest and mix all the other ingredients in a bowl until it’s smooth and glossy. 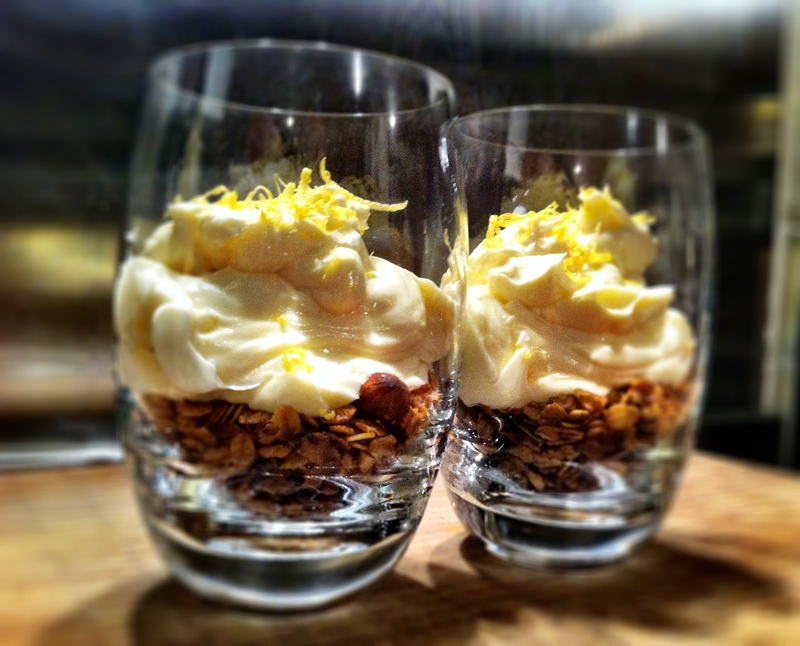 To serve, spoon about 3-4 tablespoons of your oat ‘n’ nut biscuit base into each service glass or dish. Divide your cheese mixture into two and spoon over the crunchy base. Sprinkle the remaining lemon zest over the top for decoration. Grab a spoon and dig in!